Today we would like to talk about the Mac version of the EVE Online game, and especially how to uninstall EVE Online from your Mac. It is important to remove apps safely and correctly in order to prevent possible technical issues in the future. In this post, we will share two ways to remove EVE Online, and how to free up space on your Mac. How to uninstall EVE Online manually. How to uninstall EVE Online automatically. For Mac users, playing the EVE Online game is possible via the EVE Launcher for Mac. 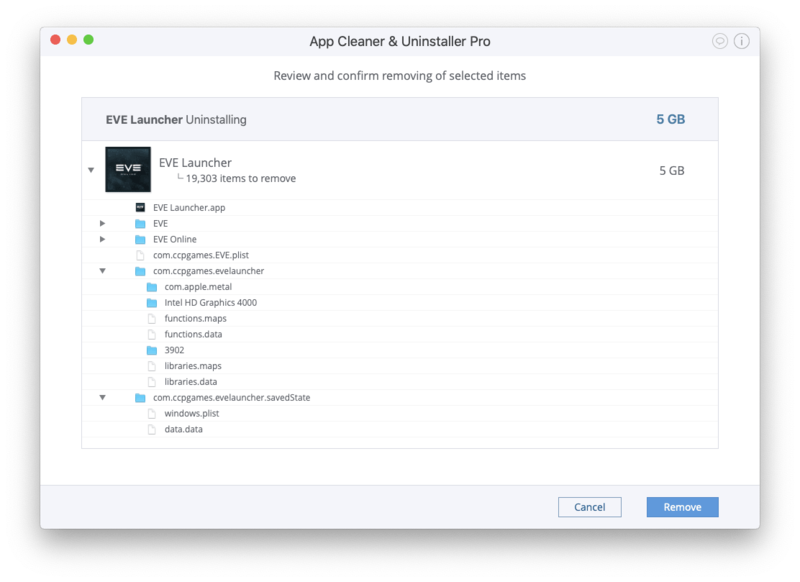 Most Mac users delete the EVE Launcher.app file, thinking that it is enough to uninstall EVE Online on their computers. However, every application consists of various files, including its service and executable files, spread throughout multiple libraries. As you may notice, the minimum storage space requirement for the game is 2GB (while 16GB is preferable). The executable file takes 187.5MB, which means that the rest of the required storage place is needed for the app’s service files. If you only delete the executable launcher file, you will not completely uninstall the game. Log off EVE Online and quit EVE Launcher. If you doubt that all processes of EVE Online are stopped, use the Activity Monitor to check them. Open Activity Monitor from the Utilities in the Applications folder and check if EVE Launcher is in the list of disk processes. If so, select it and click on the cross icon in the top left corner. Click on the Quit button to proceed. 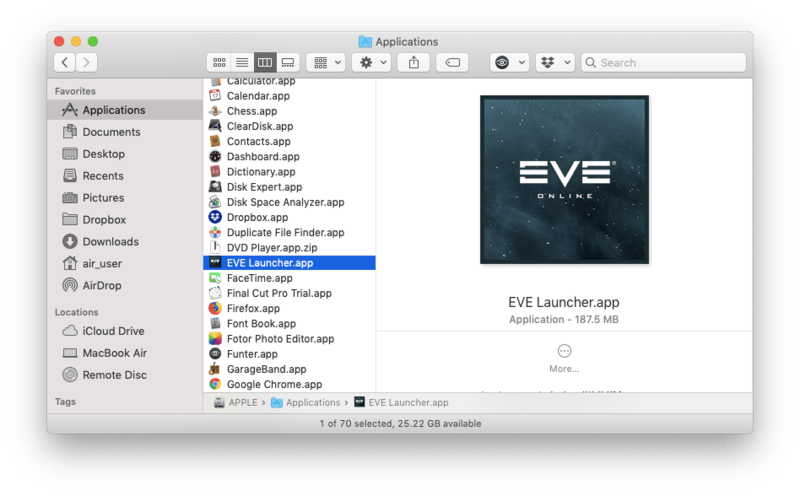 Then in the Applications folder, select EVE Launcher.app and drag it to the Trash. Now find and delete all service files related to the EVE Online game, the EVE Launcher application, to CCP Games. 4. Empty the Trash to completely remove EVE Online and all its remains. You should also keep in mind that each Mac user may have a different number of service files, depending on the user’s preferences and the frequency and duration of playing EVE Online. 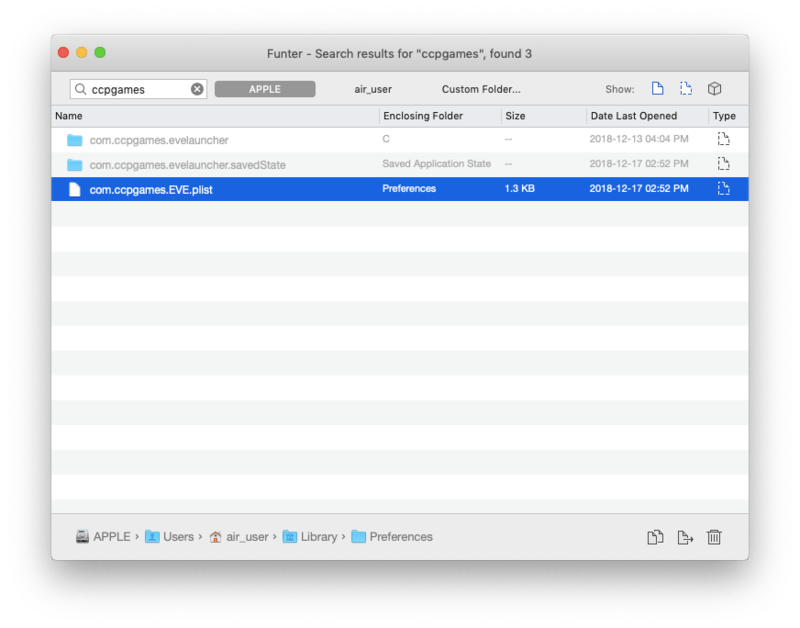 So, we recommend that you use Funter, a free tool that will check to see if there are any remaining EVE Online files on your disk. Just launch Funter, and type together and separately EVE Online, EVE Launcher or CCP Games and hit Enter. The app will display the list of all the files associated with the search word, including hidden files. In the case that there are any files, delete them and then empty the Trash. Choose EVE Launcher in the list of items in the Applications tab. All its service files will be selected automatically. Click on the Uninstall button next to EVE Launcher, or click on the Remove button in the bottom right corner. Overview the files you are going to get rid of and click on the Remove button to proceed. Complete the deletion of EVE Online Launcher and all its service files by emptying the Trash bin. If you use your Mac for pleasure and are not a computer geek, we recommend that you use App Cleaner & Uninstaller to easily remove programs from your Mac. 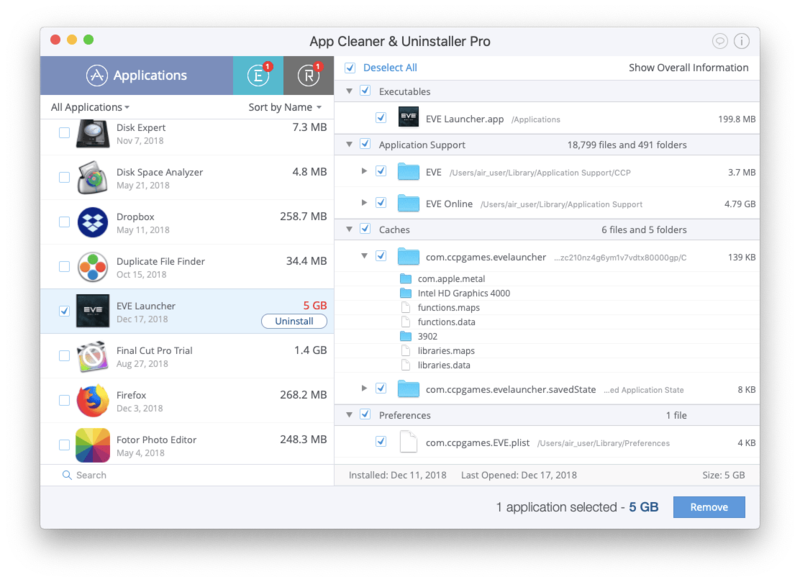 App Cleaner & Uninstaller removes apps correctly and entirely in less than a minute. Download App Cleaner & Uninstaller and use it to remove any unneeded app from your Mac. It is very likely that you will use this app as a handy, everyday tool.